If you are interested in building efficient business solutions using Hadoop, this is the book for you This book assumes that you have basic knowledge of Hadoop, Java, and any scripting language. If you have a basic understanding of Hadoop and want to put your knowledge to use to build fantastic Big Data solutions for business, then this book is for you. Build six real-life, end-to-end solutions using the tools in the Hadoop ecosystem, and take your knowledge of Hadoop to the next level. 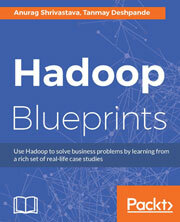 Start off by understanding various business problems which can be solved using Hadoop. You will also get acquainted with the common architectural patterns which are used to build Hadoop-based solutions. Build a 360-degree view of the customer by working with different types of data, and build an efficient fraud detection system for a financial institution. You will also develop a system in Hadoop to improve the effectiveness of marketing campaigns. Build a churn detection system for a telecom company, develop an Internet of Things (IoT) system to monitor the environment in a factory, and build a data lake – all making use of the concepts and techniques mentioned in this book. The book covers other technologies and frameworks like Apache Spark, Hive, Sqoop, and more, and how they can be used in conjunction with Hadoop. You will be able to try out the solutions explained in the book and use the knowledge gained to extend them further in your own problem space. This is an example-driven book where each chapter covers a single business problem and describes its solution by explaining the structure of a dataset and tools required to process it. Every project is demonstrated with a step-by-step approach, and explained in a very easy-to-understand manner.